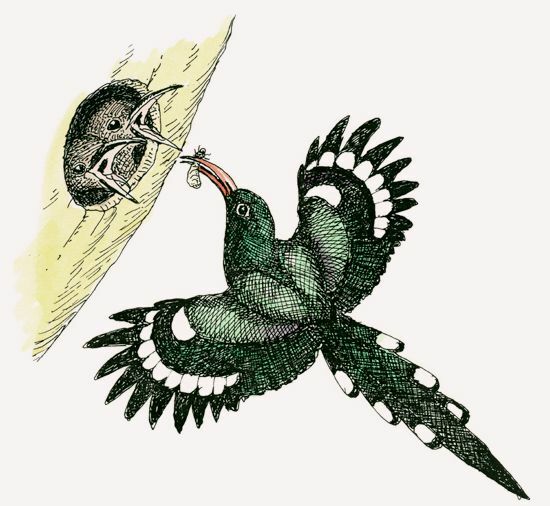 Green wood-hoopoes are naturally generous, often helping in the feeding of chicks—and not just their own. In California’s San Diego Zoo, when no chicks were available, a hoopoe delivered some of its food directly to the open mouth of an obviously startled neighbor, a kingfisher. How do green wood-hoopoes help ensure that as many of their chicks as possible survive to adulthood? They nest in enormous, gregarious colonies where all the adults cooperatively feed the chicks. Older siblings help their parents feed younger chicks. They lay their eggs in other birds’ nests. Before they breed on their own, older offspring will sometimes help their parents feed younger chicks. This helps ensure that as many chicks as possible grow up. Green wood-hoopoes are territorial and live in family groups. Green wood-hoopoes (which often look more blue than green) usually cluster in small, noisy groups. They defend their territory with wing-fanning and tail-swaying displays. Green wood-hoopoes usually hang upside down on tree branches and poke into crevices in search of arthropods, especially insects, including their larvae. They will also eat small reptiles as well as seeds and some fruits. Eggs are usually laid in tree holes previously used by other species. Older siblings aid the breeding pair, increasing the survival rate of the hatchlings. Of the eight species of birds in this family, seven are found in Kenya, where they are common except in the northern and northeastern regions. 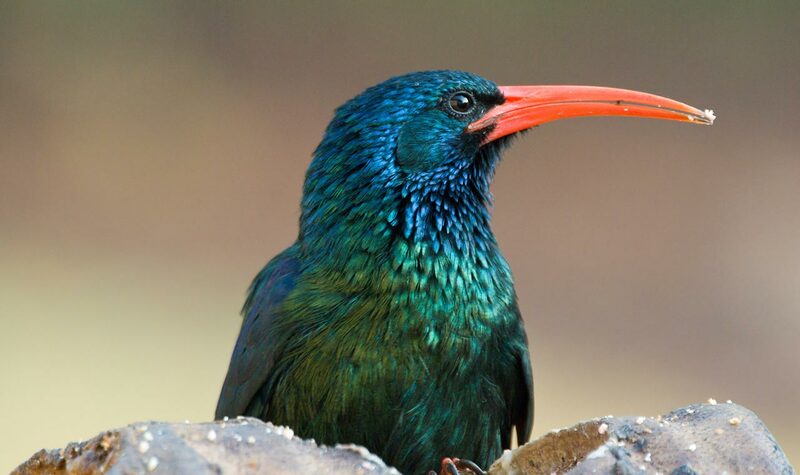 Green wood-hoopoes live only in Africa, from Senegal and Gambia, east to Ethiopia and northwestern Somalia, and south to most of Botswana and South Africa. They are numerous in wooded habitat from sea level to 9,000 feet (2,743 m). Wood-hoopoes belong to the Phoeniculidae family. That family name traces to the Greek phoenix, the mythical bird of Arabia that flew to Egypt every 500 years to be reborn.